This is a digital product. You will receive this digital code by email delivery once your payment clears. We offer Credit Card, PayPal & Bitcoin as payment options. If you have any issues you can contact us 24/7 through our livechat support.These codes have no expiry date. 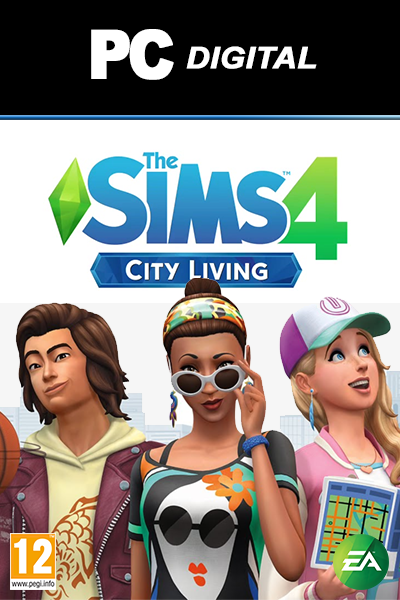 THE SIMS 4: CITY LIVING PC DLC is available right here at Livecards.eu for the best price. The standard price for THE SIMS 4: CITY LIVING PC DLC will vary depending which store you purchase it from. Our THE SIMS 4: CITY LIVING PC DLC codes are 100% legit (you can check our FAQs) and some of the Cheapest THE SIMS 4: CITY LIVING PC DLC codes available in the market. Our prices are low because we buy in bulk allowing us to offer discounted THE SIMS 4: CITY LIVING PC DLC codes. How to buy The Sims 4: City Living DLC PC? Buying The Sims 4: City Living DLC for PC from Livecards.eu is as easy as 1 2 3! Simply fill in your email address, select a payment method and complete the payment! We have some of the cheapest The Sims 4: City Living DLC for PC on the market.